Loggers, lumber barons and white pine made Michigan the greatest lumber-producing state in the country between 1869 and 1900. During that era there were an estimated 700 logging camps, and more wealth was made off Michigan white pine than by miners in the Klondike gold rush. By 1910 only a few parcels of virgin pine had escaped the cutting, and by far the most popular one with visitors today forms the heart of Hartwick Pines State Park that lies just off I-75 between Grayling and Gaylord. Referred to simply as “the Pines,” this 49-acre forest is the largest contiguous stand of old-growth white pine in the Lower Peninsula. Some of the largest trees are more than 300 years old and stand 130 feet tall with trunk in excess of 40 inches diameter. Such towering pines are often the largest tree most people ever see in Michigan and their size and grandeur overwhelm most visitors, especially children who would stand there and gaze at that massive trunk and unknowingly gain a sense, and maybe even an appreciation, for old growth forests. 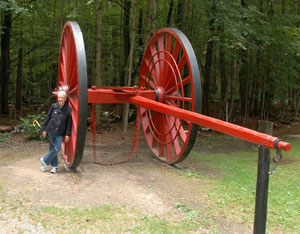 Winding through the Pines is Old Growth Trail, a paved path that provides access to a reconstructed logging camp, big wheels and a logging museum that recounts Michigan's White Pine Era from 1840 to 1910. The interpretive area is fascinating, but there is more to this state park than virgin white pine. At 9,672 acres, Hartwick is the largest unit in the Lower Peninsula and has a diverse terrain that includes four small lakes, stands of virgin jack pine and hemlock and rolling high hills that overlook the broad valley of the Au Sable River's East Branch. The park offers activities year-round, everything from morel mushroom hunting and trout fishing in the spring to hiking and mountain biking in the summer and Nordic skiing in the winter. Beyond the Old Growth Trail, Hartwick has 6 miles of designated foot trails with the longest walk being the Au Sable River Trail. The 3-mile loop begins from a trailhead on the east side of M-93 and passes through a hardwood and conifer forest, twice crosses the East Branch of the AuSable River, a noted trout stream, and at one point reaches the height of almost 1,300 feet. The Mertz Grade Trail shares the same trailhead with the AuSable River Trail but swings south after crossing M-93. This 2-mile trail loops around Hartwick Lake before recrossing M-93. 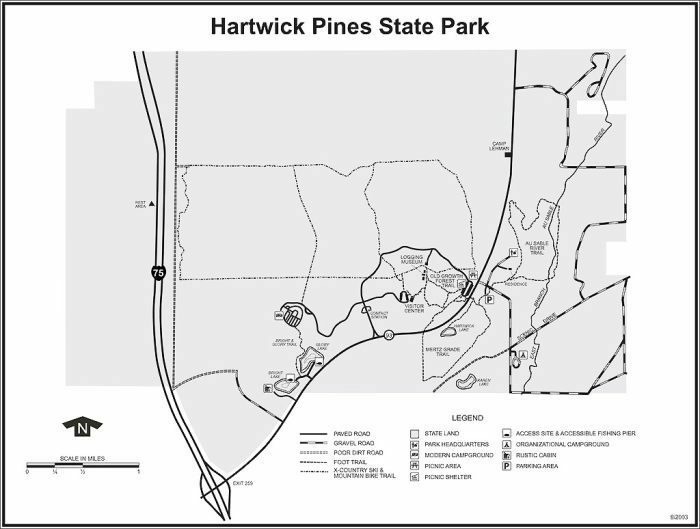 The ski trails at Hartwick Pines are open to mountain bikers spring through fall and make for a 10-mile system that basically forms a 7.5-mile loop with two crossover spurs. The route is a wide path through a rolling forested terrain and is rated for beginner and intermediate bikers. The bike trailhead is in the day-use area parking lot at the end of the park road. 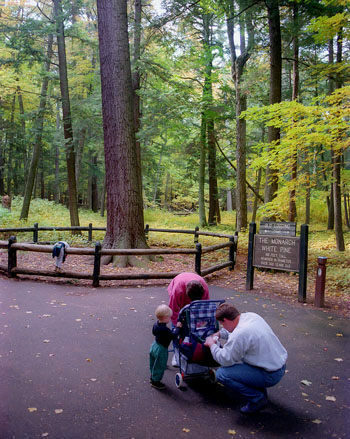 Rebuilt in 1994, the Hartwick Pines campground is now located in a much more isolated corner of the park on the west side of M-93. The modern campground is almost twice as large with 100 sites. Most of them are situated in an open grassy area but along the edge are wooded sites that offer a surprising amount of privacy for a modern campground. Along with sanitation for RVers and a modern restroom/shower buildings, the campground also has paved spurs, many of them drive-through for larger recreational vehicles. 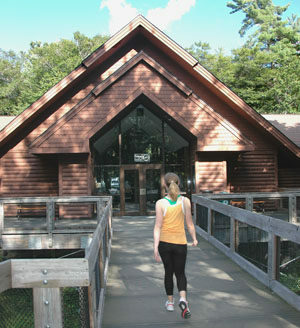 Hartwick Pines also has a rustic cabin near Glory and Bight lakes with a foot trail that connects it to the rest of the park. The stone and log cabin sleeps six and is just off M-93. Hartwick Pines has no swimming area but there is a picnic area with a shelters at the end of the park road. Departing from the parking lot are spurs to the Old Growth Forest Trail and the mountain bike trail system. From 1-75, north of Grayling, depart at exit 259 and head north on M-93 for 3 miles to the park entrance. For more information contact the Hartwick Pines State Park headquarters (989-348-7068). For a campsite or cabin reservation contact Michigan State Park Central Reservations (800-447-2757; www.midnrreservations.com).